News or Announcement represents information about recent and important events of the company. Follow the steps given below to add news in the admin area. Expand "News" section in the left navigation bar, click on "Add News" link to open Add News page. In multi-language edition, language name in which the news will be added is mentioned with panel heading. As mentioned in the screenshot, the news is being added to English language, so, English is written with "News Details". You can change the language from language drop-down available on right side of the screen. Enter the news title in "Title" field. The title is heading for the news. Multiple news with the same heading is not allowed in the knowledge base. "Content" field contains the body of your news. 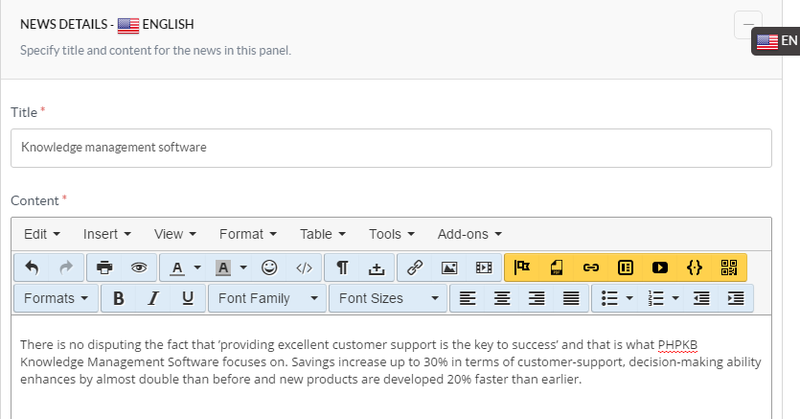 You can use HTML, images, videos, tables to customize your news content using WYSIWYG editor. In "News Options" section, you can set the visibility and expiry date for the news. Marked checkbox of Visibility option makes it visible to the readers. You can specify the date up to when news will be visible to front-end users through "Set Expiry Date" option. Click "Preview" button to review the news details before publishing. If you find any discrepancy, you can edit the news from preview screen. Click "Save" button to save the news item or you can cancel the process using "Cancel" button. Users can view the latest news in "KB Home" section of the knowledge base. List of all the published news items can be seen under News & Announcements section. In the News & Announcement page, click on the news title to view the news content. For more details on how news appear in front-end, refer End Users Interface articleEnd Users Interface.